I'm really looking forward to several Northern California shows with Billy Shaddox. I first heard Billy play with Billy Midnight opening up for the Mother Hips long ago in San Diego, and he hasn't stopped writing good songs ever since. This time, he'll be joined by Isaac Parsons (The Mother Hips) on bass and Brett Behrendt on drums, and I'll have Deren Ney, Steve Adams, and Mike Curry of the Gramblers on board. I'm am pleased to announce the official release of my new album, Runaway Blues. 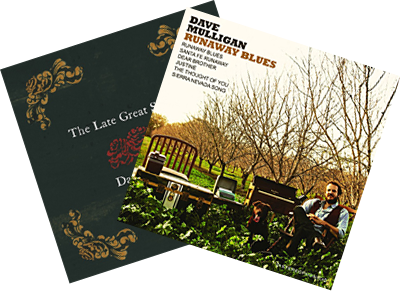 Recorded at Tim Bluhm's Mission Bells studio, Runaway Blues features performances by Tim & Nicki Bluhm, Jackie Greene, Deren Ney and Greg Aiello. In conjunction with its release, I am rereleasing my first record, The Late Great Southwest, also produced by Tim Bluhm and featuring appearances by Tim, Jackie Greene, John Hofer, Tom Heyman and Steve Poltz. It has been remastered and repackaged, and I'm proud of how albums sound. Both are available in my Store, as well as on iTunes and other digital distributors. Even if you don't recognize Dave Mulligan's name, there's a good chance you recognize his work. As a member of Nicki Bluhm & The Gramblers, Mulligan has toured the country as rhythm guitarist for the grassroots pop rock outfit. Recently the band has been blowing up on YouTube, where their tour van rendition of Hall and Oates' "I Can't Go For That" has garnered over a million views. But Mulligan is also an established artist in his own right, gearing up to release his second solo record, Runaway Blues, with producer Tim Bluhm (The Mother Hips). Synthesis spoke with Mulligan in anticipation of his upcoming performances in Chico. Your new record got the full studio treatment, as opposed to the last one, which was recorded in a tiny apartment. How was the change? For how different the settings were, the recording process was actually quite similar. Pacific Dust was located in Tim [Bluhm]'s studio apartment in San Francisco's Marina District and The Late Great Southwest was one of the first full-length albums he recorded there. I remember showing up for our first meeting and wondering how two guys of our stature were going to fit in there! He had a one-inch tape machine and a lot of the same gear that now lives at Mission Bells, but there wasn't a computer to be found. We didn't have Internet or cell reception either. As a result we were completely engulfed in making that record day in and day out for a week straight. I think we both have special memories of that time. How would you compare Runaway Blues to The Late Great Southwest? I wrote the songs for The Late Great Southwest over the course of several years while music was still just a hobby for me. When I made the record, I didn't have any plans or expectations beyond its release. I wasn't concerned with how the songs would translate to live performance, I was just intrigued by the notion that I could make a record that reflected the wide variety of styles that I loved, from balladry to country to rock. Runaway Blues is a more focused collection of songs. This time I knew the songs I was writing would end up on a record, so I had a clearer picture of how I wanted them to sound individually and how I wanted them to work together as a whole. I also wanted to make sure that the sound of Runaway Blues was something that I could recreate live, so that provided some framework as far as instrumentation goes. Acoustic guitar, bass and a simple drum kit hold down most of the record and Deren Ney [Gramblers] provides some great lead playing. I am lucky to have him onboard for most of my local shows, so that really helps the songs carry over from record to stage. I read that most of the songs on Runaway Blues were written while you were livings in your van in Yosemite. You've gotta tell me more about that. I returned to the States in May 2009 following a year spent in Ireland. A friend of mine invited me to park my van at his house just outside Yosemite National Park and we spent much of that summer exploring the Sierras. I didn't have much money, but I had lots of free time and found plenty of creative inspiration there. The songs "Dear Brother" and "Sierra Nevada Song" were actually written while backpacking when I didn't have a guitar handily, and I remember how good it felt to come off the trail after those trips and get right to work figuring out chords over a nice cold beer. You've traveled all over the world, but you always seem to return to the West. What's the appeal for you? One of the things I learned while vagabonding was that I craved the roots that develop socially and creatively when you have a place to call home. There is a creative community here that is unlike any other place I've lived and it feels good to become more and more invested in it. I love the fact that the majority of my friends here don't have traditional day jobs, but instead have figured out how to survive by prioritizing whatever their passion might be. Especially for artists and musicians, it is important to have those examples around you if you are trying to keep your own head up doing the same. The Gramblers' "Van Sessions" videos are blowing up. Why do you think that is? Is the whole thing just surreal? Surreal is the only word to describe it. We were at a taco shop the day after we posted it when we heard that Hall and Oates had shared it on their Facebook page and we were freaking out over that! I feel very lucky to be in a band that genuinely loves each other and loves doing what we do together, whether it's on stage, in the studio or in the van between shows. I think that comes across in the van sessions, and I'm pretty sure that's the appeal for a lot of people. It's real. There's no production, no makeup and no razors, just an iPhone strapped to the rear-view mirror. And, of course, at the heart of it all, there are some great songs. One of the best things about the van sessions for ourselves is that we get to spend time studying those songs and contemplating the choices that were made as they were written and recorded, which can only help our own songwriting and sensibilities as a band. VIDEO - "THE THOUGHT OF YOU"